LAMERI S.p.A. has been transforming and trading cereals since 1968. 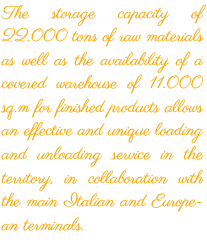 The storage capacity of 22.000 tons of raw materials as well as the availability of a covered warehouse of 11.000 sq.m for finished products allows an effective and unique loading and unloading service in the territory, in collaboration with the main Italian and European terminals. In addition, Lameri has an important and active center for cereals storage at Cremona’s port. The plant situated in Cremona manages mainly semi-finished cereals for confectionery and baking industry. The storages located in San Bassano, equipped with a plant among the most technologically advanced, are designed for finished products, in particular for the consumer division. Lameri takes advantage of its four production lines of which one is multifunctional, that enables the transformation of raw material to obtain different types of cereals, such as flakes, flours, pearl, extruded, and puffed. The production process includes different stages of selection and mixture of ingredients, cooking, toasting and a possible final coating, diversified by to the technologies used: extrusion, traditional technology and, puffing process.